The Lost Vikings is a puzzle-platform video game developed way back in 1992 by Silicon & Synapse (now Blizzard Entertainment). A bizarre back story tells of how three Vikings (Erik, Baleog and Olaf) were captured by the ruler of the alien Croutonian empire for an alien zoo. They somehow manage to escape and must work together to find their way home. What that means in practical terms is a platform game where you run and jump around various locations, solving puzzles, killing enemies, and occasionally taking control of one of the other Vikings when you need to use one of their special skills. There are all the usual game elements to keep you entertained. 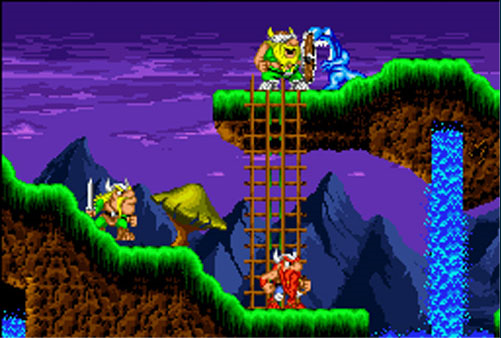 A health score falls away as you get hurt, eating food or using armor can help, special weapons each have their own custom effects, there are various hidden places with items to assist you along the way, hint buttons in the early levels point you in the right direction, and there's a password system which allows restarting the game at your current level. It's a lot to learn, but fortunately a "The Lost Vikings Manual.txt" file in the download explains everything you need to know. And although this was a DOS game, The Lost Vikings uses DOSBox technology to ensure it still works - more or less - on even the latest 64-bit PCs. The graphics are as basic as you'd expect for a 20+ year old game, and the sound didn't play for us, but if you're a fan of retro platformers then there's plenty of fun to be had here.